Whether you own a home that you live in, or an investment property, chances are that you have paid attention to its value over the years. It is a well-known fact that certain home renovation projects raise the value of a home, while others do little but maintain its current value. So, before you put any money into a property, it is helpful to consider the costs versus the total value of the project. Known as return on investment (ROI), this figure helps you make better decisions about which area of your home to remodel and which materials to invest in. In the graphic above, we broke down the information from Remodeling Magazine’s 2019 Cost vs Value Report. We color-coded it for easy scanning. The gray areas indicate how much a project costs, while the colors indicate the percentage recouped. Different colors are used for the percentage values so that you have an easy-to-understand view of how the different projects match up. Remodeling Magazine has published this report for years, giving homeowners detailed access to information that can impact them on a national or regional level. 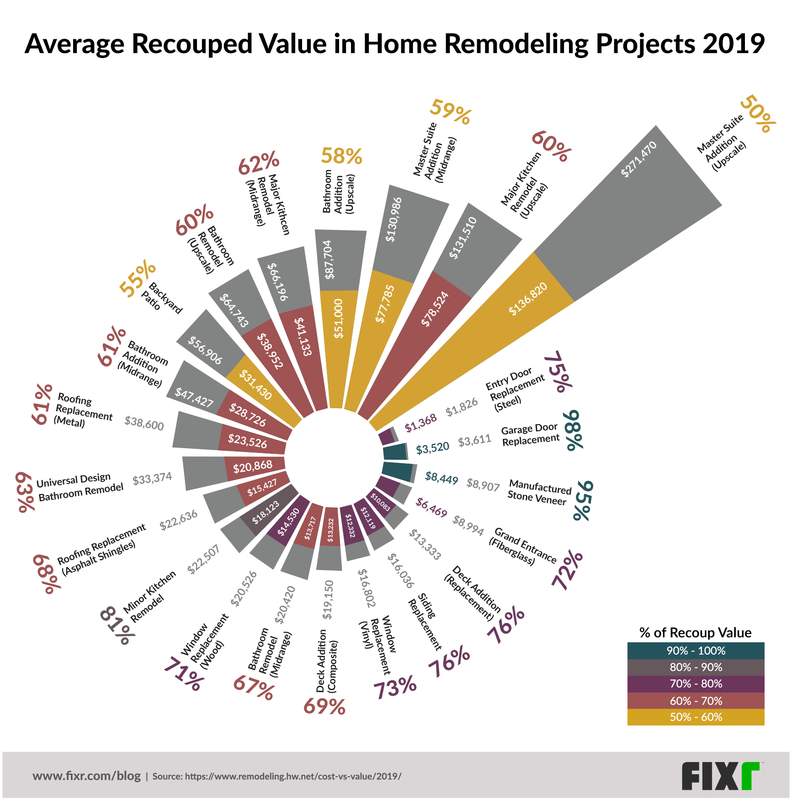 For the last two years, Fixr has also broken down this report to help homeowners make more informed decisions regarding home remodeling projects. Taking a broader view of these reports lets you pinpoint trends that may be important. For example, in 2017, home insulation, stone veneer, and steel entry doors were the three projects that recouped the biggest return. In fact, insulation at the time was bringing in a whopping 108% ROI. In 2018, however, things changed. First, the report was dramatically reduced, focusing on fewer projects than in previous years. Stone veneer and steel entry doors were still in the top three highest grossing ROI projects, but the top spot was taken by garage doors. In fact, nearly all the highest ROI projects had to do with the exterior or curb appeal of the home. Insulation no longer made the list at all. For 2019, it appears that trends are moving again. While each year shows growth in some areas and a reduction in others, the biggest standout change is in upscale projects. More high-end-level projects made gains in their ROI this year over the last several years. This indicates that homeowners are putting a bigger emphasis on luxury and quality remodels for their homes. Garage doors and stone veneer still get you the most bang for your buck, but it is worth considering the materials and types of projects that are currently trending upward as well. If this trend continues, it could indicate a change for what homebuyers will be looking for within the next few years. According to ProRemodeler, 2018 was the year of the splurge spending. This is certainly born out by the Cost vs Value Report for 2019. Upscale is on the rise, and many previously popular areas are beginning to lose their value. For example, even though garage doors and stone veneer still get the biggest return, it is smaller this year than in years past. This makes it more difficult to determine where to invest in the future. While trends tend to dictate movement over the course of several years, they can sometimes move quickly in the real estate industry, particularly during times when spending is up and unemployment is down. Those wondering where to put their money in their homes need to look back as well as ahead. Projects that have held their value with few fluctuations over the last few years are more likely to continue providing good returns over the next few years as well. This includes minor kitchen remodels. This year, its ROI is around 81%, which is much higher than many other projects. A backyard patio has a 55% ROI. While this does not give you the biggest return, it is climbing and has remained fairly steady for the last few years. With an emphasis on homeowners putting more money into their outdoor spaces, a backyard patio seems like a good investment to make. Finally, while they have also had some small ups and downs, exterior curb appeal-oriented projects, such as stone veneer and garage doors, remain good investments. New to the list this year is metal roofing, which has a respectable ROI of 61% - something to watch in the future. 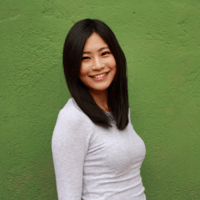 Remember that your particular ROI can vary depending on many factors. Specific regions and even neighborhoods may get a higher or lower value on projects than those on a national level. Make sure you are paying attention to the trends close to your home as well as these larger-scale figures. Look to see which investments are the most likely to hold their value for you so that you can make better decisions for your home in 2019.